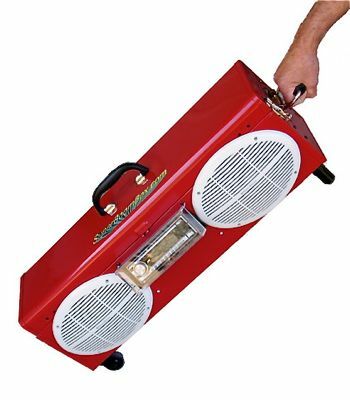 The Super Boom Box is a $1,895, built-to-order tank of a boom box that plays radio, CDs & MP3s. Play music from AM, FM, CD, or a USB Flash Drive source. Up to 65 hours of unique music can be stored on a 4GB Flash Drive (based on our benchmark tests, 1000 songs fit on a 4GB Flash Drive when the average song is 4 minutes long). ed for poor lighting conditions. Audio amplifier power output is rated at 20 watts RMS X 4 channels at 4 ohms (50 watts X 4 maximum). The two 6‚Äù X 9‚Äù 3-Way Pro Series speakers use a waterproof material for the external portion of the speakers. They feature a 13mm neodymium tweeter, a 51mm midrange, and a powerful 6‚Äù X 9‚Äù carbon cone woofer for wonderful sound reproduction. Speakers are capable of handling 100 watts each. Battery operated by a high capacity 12 volt rechargeable gel cell. A new, fully charged battery, operated the SuperBoomBox at almost full volume for over 12 hours. The SuperBoomBox is designed to be weather resistant. Marine grade speakers, designed for the demanding boating industry, along with a clear splash cover for the radio, and a weather resistant box keeps your SuperBoomBox blasting tunes even during rain showers. SuperBoomBox is assembled in the U.S.A.
It’s big, it’s stupid, it costs nearly two thousand dollars and it’s made in the U.S.A. You got to love it! I’ll bet it’s 100% Hummer-compatible!